We had been treated to a wonderful sunset – the yellows, oranges, reds and purples reflected in the mud flats of the Dornoch Firth at low tide. This morning though we woke to drizzle and cloud. 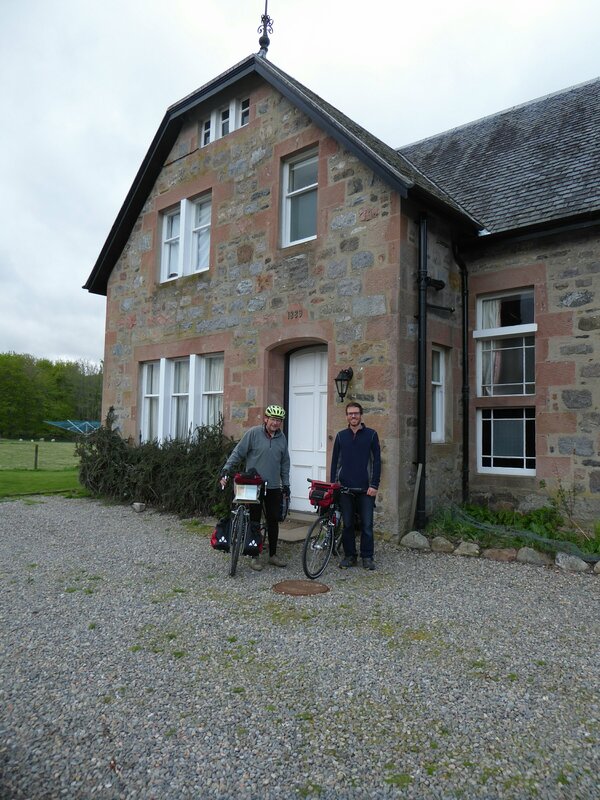 We were planning a late start at we were not wanting to arrive at our destination before 7 so we had a lazy breakfast then pedalled (without panniers) the couple of miles to the Glenmorangie distillery for a guided tour. The first thing we learnt was that we southerners had been pronouncing the famous whiskey name incorrectly all these years. Its Glen – morangie, rhyming with orangie! We set off with a mixed international group round the distillery process. The ‘malt’ of malt whiskey is the process of allowing the barley to start germinating before drying (this process is now done off site), it is then ground coarsely to make ‘grist’ (presumably the source of the saying ‘grist to the mill’. The grist is ‘mashed’ then the outflow is stirred with the yeast – all in gleaming vats and very technically regulated. 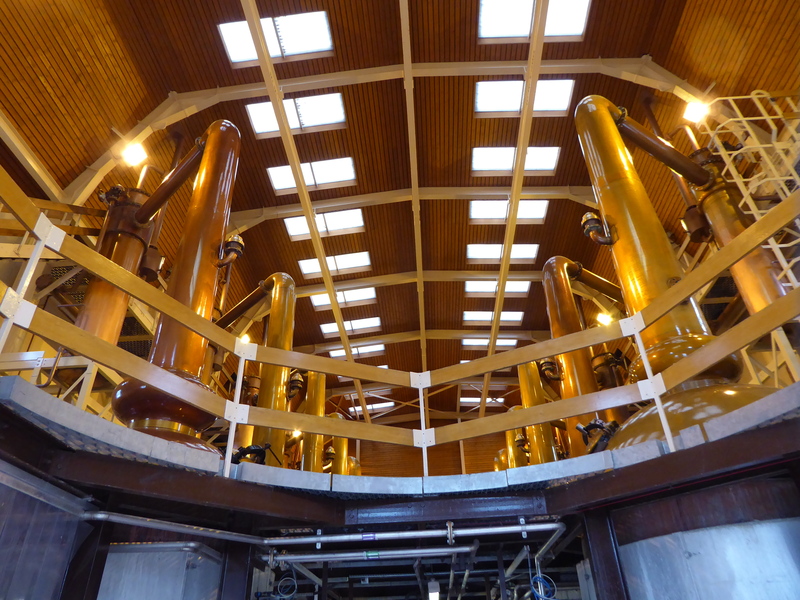 Then the actual distilling (they proudly have the tallest stills in Scotland) and finally the aging in oak casks – this is in ex bourbon casks sent over from the USA where regulation only allows them to be used once). The distillers are called the ‘men of Tain’ and to date there have been no ‘women of Tain’. In all the distillery only employs 23 people but it exports this symbol of Scotland all over the world. Many of our fellow tour folk were off to their next distillery tour but I think seeing the process once was enough! Having sipped our small dram at the end of the tour (11am a bit early for whiskey) we cycled back through the drizzle and packed up for departure. The rain had stopped by the time we left but there was a strong wind but this eased as we took the side road inland to avoid the manic A9. This pleasant road took us through woods and fields, showcasing the fertile land with it’s relatively temperate climate. 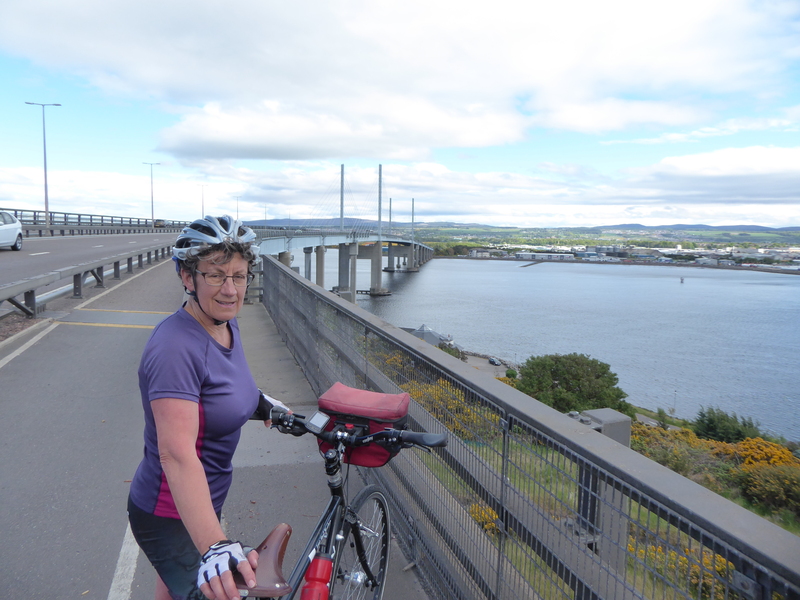 A long gentle up hill gave us views over the Cromarty Firth followed by a more precipitous descent into Dingwall. 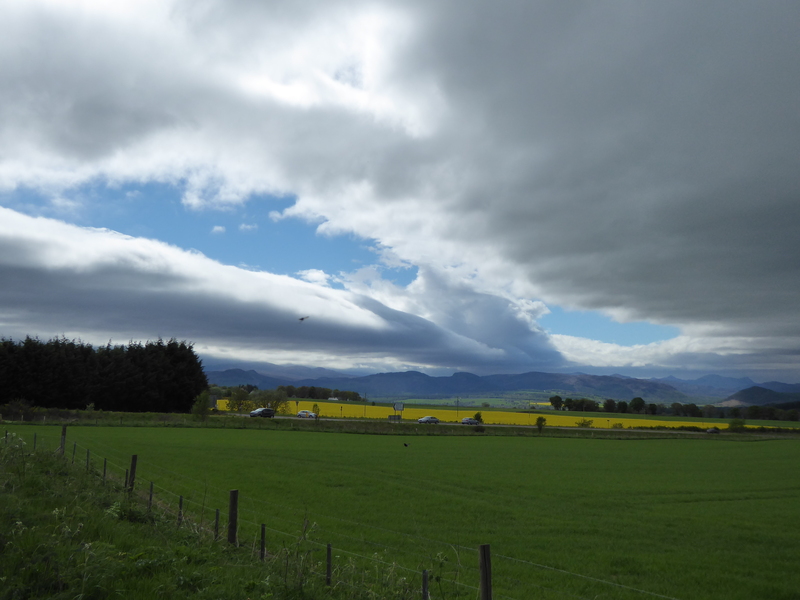 There we found a bike shop to pump up our tyres with a hand pump and a pleasant picnic spot on the shores of the firth – with our first few midges. There was no choice but main roads out of DIngwall, although they had bike paths alongside it was still noisy and not particularly pleasant. After a while we were able to branch off and picked up a beautiful little road right alongside Beauly Firth with flower strewn verges , completely flat road and the wind behind! This took us right to the bridge over into Inverness. After a reviving cup of tea we picked out way of Inverness with David’s usual excellent rout finding (in and out of cities being the hardest navigation when cycling). The formal bike route takes a big loop to avoid the A9 but we weren’t in the mood for that so we took a route where we braved 3 miles on the dual carriageway – no hard shoulder or even ribbon to cycle on – but it was nearly all down hill and not too busy so it was only a short stretch and we lived to fight another day as we turned off onto the road to Moy. Just as we were starting up the hill we heard voices calling us. It was Charlotte and Nick, our Warmshowers hosts for the night. After the briefest of hesitations they packed our panniers into their van and cycled the last hill weight free – felt as if we were flying up. For those who are new to our blog ‘Warmshowers’ is a touring cyclists website offering free accommodation, in return offering your home to passing cyclists. It is where we have had our most enjoyable stays over the years and this evening was one of them. Charlotte and Nick are both doctors and recently moved to the area for Charlotte to start her Urology rotation (‘plumbing specialist in Charlotte’s words). They are renting an amazing farmhouse high on the moors. By one of the quirks of coincidence they know our very good friends in Bewdley, John and Linda Iles – Charlotte’s parents being very old friends of theirs. In fact John and Linda are attending their wedding in a few weeks time. Their hospitality was wonderful, they cooked us a superb meal and we had enjoyable conversation until eyelids drooped and it was time for bed. A memorable stay and we wish them all the best for their wedding and their future together. Not sure it’s ever too early for whisky in the highlands!